When He Won't Lead. What do you do when he isn't a leader? What do you do when he won’t lead? When we were first married, I’m guessing I was just like any other bride. I knew that we weren’t perfect, we had already experienced clashes before the wedding, and all that stuff. But I guess I thought I knew what to do. I had in my head that I would be the submissive wife and I would let Jason lead in everything. So I tried. In my head I though that as the head of the house he should be in charge of everything. The leader spiritually, in charge of our finances, and basically in charge of everything that went on around here. He was in charge right? The mail came, and the bills and bank statements all got handed to him. Why should I be the one to do it, can’t you? Yes, but you are supposed to be the leader. What does being the leader have to do with doing the bookwork? No. I am not good at this stuff, you are, you should be the one to do it. So our argument went. He was supposed to be the leader. He was supposed to be in charge. How was I supposed to let him lead, if he wouldn’t even do it? So, what do you do when he won’t lead? Turns out, he was leading. It took me awhile to figure that out though. He was leading. He knew the best option for us financially was to put me in charge of the bookwork. (I married with a savings, he married with debt, you do the math.) But I was so blindly assuming that the only way for him to lead, was to do it himself; that I in all my attempts to make let him lead, that I was really usurping his authority. If he was leading in the way I thought he should, or the way I told him to, would he really be leading? Or would it be me doing the leading? In the end, I learned that we make a great team in the financial department. He is still the leader. Sure I do the book-work and pay the bills and balance the checkbook, but he is the one in charge. In fact, it was his idea to buy rather than rent. His idea to refinance. Many of our bigger financial decisions were his ideas. I learned that being the leader, doesn’t always mean doing all the work, sometimes it means choosing the person best suited for job to take charge. And that’s exactly what Jason did. So what do you do when he won’t lead? Take a real good look at the situation, chances are, he is trying to lead, but you may be hindering it, because he isn’t leading the way you think he should. Now, I know there are some cases when he won’t lead, and it’s because he has no interest in that area. In that case, the only advice I can offer is to pray. On to Matrimonial Monday. Share any post you may have that has to do with being a Godly wife. Don’t forget to visit at least one link for every link you add! You’ve made some great observations, Kendra. I especially like how you challenge us to realize that our husband’s may really be leading us–just not “leading the way we think he should.” I think I’ve struggled with that quite a bit in my marriage. Sometimes it feels like he’s not making a decision or leading, but he’s making the decision to stay still or wait. The reality is that’s “leadership.” Thanks so much for sharing your story. It’s an encouragement! May God give our husbands the strength and wisdom to lead and us the meekness to follow. Thanks for the great post & for hosting & God bless! I loved this post, Kendra! I especially loved the part where you said “you do the math.” Lol! You are right, just because they aren’t doing it the way WE think they should do it doesn’t mean they aren’t leading. We need to let them be who they are and use their God given gifts and talents and strengths in our marriages, and we need to do the same. My hubby does the bills. Not because I can’t but because paying the bills stressed me out when I was single. If I am doing the bills I am too tight fisted and too frugal with money. I would just make our lives miserable by saving every penny. That’s not a BAD thing, but you can’t be a miser about it and I would be, lol! I started with a savings account too, and so did hubby. The difference was that I stressed about spending and saving money, and he didn’t. So he took over the bills and I have felt free to relax and not worrying about it! I know what you mean about the miser thing too though. I sometimes worry that I place to much importance on money, I mean I get so tickled when we can add a bit more than normal to our savings in a month. Hmmm….I have done the same thing with the finances and came to the conclusion that I wasn’t submitting if I refused to do them in the ‘name’ of leadership on the part of my husband. He was leading, just like you said. Thanks so much for hosting your linkup today. Very true Kendra, delegation is leading too. Thanks a lot for hosting, do have a super blessed day! LEADERSHIP vs. Management….. something I am just beginning to learn the difference between. I thought in order to “Lead” , it meant you had to DO everything. To lead effectively, requires you to TRUST someone else you delegate to accomplish tasks. When I don’t allow my husband to lead…and often that means encouraging me that I am CAPABLE of doing certain things… it really speaks to the fact that I don’t trust his confidence in me. Love this Kendra! Thank You! Very good point. We often do not have confidence in ourselves so when our husbands do, it seems so strange to us that we do not trust them. GOOD JOB, KENDRA! Your statement, “Sometimes we don’t think any thing like our men do we?” is so true. “Most of the time we think things the very opposite!” Then we need to have some real communication. As I was reading the conversation you had playing out in your head I was thinking, “But he is leading?” And then I saw your revelation that came at a later date, “Turns out, he was leading. It took me awhile to figure that out though. He was leading. He knew the best option for us financially was to put me in charge of the bookwork.” Yes! This is a wonderful post. We experienced similar situations in our marriage in areas other than finances. Sharing this via Pinterest! Yep!! Funny, I have a Jason too, and that discussion happened with us too. He is leading by choosing for me to do the account. Great post! Funny 🙂 Jason is a very popular name. I’ve noticed that a lot of men choose to have their wives handle the accounts. I love this post! I went through the exact same thing. It took me quite a few years to accept that I really should let him *make decisions* including delegating things to me. I think a popular book of the day was instrumental in my struggle–one that stated that Godly husbands should be in charge of finance. Period. With so much well-meaning but conflicting information out there, we just need to be constantly communicating, both with God and with our husbands, to find the best way. Just found your blog through Growing Home, and I’m wondering if we’ve ever met IRL. 🙂 Small world. Yes, I think books and my mom’s attitude about it definitely made me think that the men should take care of the finances. I know that as you read this, some of you might be feeling very frustrated. Maybe even a little bit hurt. You are leading by default. 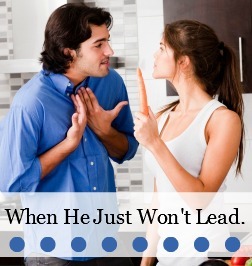 You are leading because your husband won’t lead. Or you are leading because you feel your husband doesn’t know how to lead. This is where I want you to prayerfully consider this next thought: Your husband may be fearful of leading, of making the wrong decision, of not cutting it when it comes to your –or his family’s – expectations. If that is the case, that is where he needs your partnership, your prayer and your praise. I didn’t make it in time to link with the collection, but here is a post that I love Forgiveness & Unconditional Love I still struggle a lot with him not leading because his faith has been hurt and though I would say he loves God he doesn’t have that personal relationship. It’s heartbreaking because I went into marriage thinking he would become this strong leader. Now for not having that personal relationship he does a LOT of leading. He makes all tough decisions in most matters, tries very hard to meet all of my needs, has lately taken to checking himself to see if the issue is him, me or both, and truly does what I thought a “husband” should do. It just breaks my heart that he doesn’t have that loving relationship. Sorry I wrote you a book. That is a very interesting post you shared. I wanted to tell you, that if you stop back by here every Monday there will be a new linky that goes up and you can always share your posts then! This is excellent! You came at submission from an angle not often covered but so very needed! My husband does not lead in the same way I would and sometimes I have to remind myself that my role as support person often means I’m in “charge” of certain areas. It frees him for the roles that only he can do. Thank you for your constant encouragement and inspiration! I’ve had to learn this same thing about my husband. He does lead this way in certain areas. I’m still praying about his spiritual leadership though. He won’t go to church, never (no exaggeration) reads the Bible and rarely ever prays with me. I feel like I’m married to an unbeliever who believes he’s righteous. I do love him, this just grieves me greatly. I think that is where we have to pray and try hard not to nag. We have a slight issue like that in our marriage; which is why I added that little comment at the bottom of this post. It’s not an easy thing, but I do believe that the Lord can change things for us. Wow, this post was an eye-opener! Thank you for sharing your thoughts on this. I’m in a small group book study with 3 of my friends, going through the Wife School book (recently published), and it’s fantastic! Just this past week, we were studying on the man being the leader of our home. We’ve read the chapter on this and we’ll be discussing it at our meeting next week. I think I’ll print out your post, if that’s okay, and take it with me to share with my group.